Photo of President Obama by Flickr user lednichenkoolga. 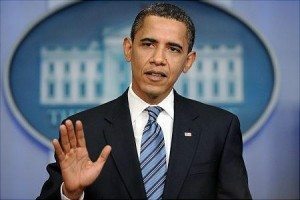 President Barack Obama [on Wednesday] took to the White House podium to deliver a strongly worded statement calling on Congress to pass an assault weapons ban, to limit sales of magazines to those that contain no more than 10 rounds of ammunition, and to close a loophole in the law governing gun sales that allows purchasers of weapons at gun shows to skip the background check required for gun purchases in retail establishments. Then he walked over to a small desk and signed executive orders that he said would provide greater resources for school safety, educate mental health workers on their options in reporting threats, and one that directed the Centers for Disease Control to conduct research into the causes of gun violence. All told, Obama’s plan includes 23 executive actions. At the president’s side during the remarks stood Joe Biden, whose White House Task Force on Gun Violence delivered its report to the president earlier this week, after meeting with stakeholder groups, includng the National Rifle Association, whose leaders have continued to voice opposition to any new gun laws, even in the wake of the massacre of 20 children and six adults at Sandy Hook Elementary School in Newtown, Conn., one month ago. (See AlterNet’s Steven Rosenfeld, here, on the NRA’s political power.) He opened his remarks by noting that, since last month’s massacre, another 900 Americans have died from gunshot wounds. Sharing the stage with Biden and Obama were several survivors of mass shootings, the parents of one of the Sandy Hook victims, as well as group of children who had sent the president letters in the wake of the tragedy, urging him to do something to prevent more shootings. But Obama is well aware that the chances of passing an assault weapons ban are not in his favor. Even Senate Majority Leader Harry Reid seemed to write offany possibility of an assault-weapons ban passing the current Congress. NRA President David Keene, in an appearance on CNN’s State of the Union this weekend, rejected outright the gun-control measures the president laid out today. Today, the NRA released an ad accusing the president of hypocrisy because his children attend a school with armed security (which might have something to do with the fact that the children of a sitting president of the United States are enrolled here) while he has expressed skepticism about the efficacy of putting armed guards in public schools. “Are the president’s children more important than yours?” intones a narrator. In his remarks, Obama painted Congress as spinelessly in the thrall of the NRA, and called upon constituents — including, presumably, gun owners — to make their legislators pass the bans the president has called for and with which, he said, a majority of Americans agree. He went on to directly reference right-wing attacks him, in which he’s painted as tyrant worthy of overthrow. In addition to the studies he would order the CDC to do on gun violence, Obama also called on Congress to fund more research into the effects of violent video games — and took a crack at another hallmark of the right: the denial of scientific evidence. He added that he would “put everything I’ve got” into the fight for the gun-control measures, but said nothing would change unless the American people prevailed upon Congress to make it happen. One roadblock to the passage of meaningful gun control at the national level has long been the exploitation of the Second Amendment to the Constitution, whereby the right to bear arms for the sake of maintaining “a well-regulated militia” has been construed by right-wing leaders and the gun lobby as a guarantee of the right to own any weapon of virtually any kind — and as many of them as one might care to. And because of the Tea Party movement’s constant invocation of the nation’s founders and the Constitution (in a rather skewed reading thereof), Obama’s framing of his proposals as evidence of his faithfulness to the Bill of Rights was a deft rhetorical move. In his riposte to the right’s Second Amendment claims, the president invoked the religious freedoms and right of assembly guaranteed by the First Amendment, as well as a well-worn phrase from the Declaration of Independence. After assuring his audience of his commitment to the Second Amendment, Obama made clear his belief that the Second Amendment should not be permitted to trump the freedoms granted in the First Amendment, and referenced recent shootings to make his point. Until today’s announcement by Obama, progressives were occasionally heard grousing about the president’s lack of interest in gun legislation. No longer. Before the White House press event concluded, progressive groups were applauding Obama’s initiative, and announcing efforts of their own to push Congress to act. Both the Progressive Change Campaign Committee and the Courage Campaign issued statements backing the president, along with links to their groups’ petitions. ABC News has a full transcript of today’s White House Press event, here.